How can I dye a brand new white waterproof tent for an art project? Message: Hi, I need to dye a brand new white waterproof tent for an art project. I’m sure that the waterproof ripstop will reject any water and any traditional dye. Do you know of any solutions/options that won’t compromise the water resistance? Is my only option to just treat the surface by painting? I’m afraid you can’t even paint a waterproof tent! The paint will peel off of the waterproof surface. What I recommend that you do is buy some non-waterproofed white ripstop nylon, sew yourself a tent fly, dye it with acid dyes or paint it with a suitable fabric paint (buy a small jar and test it on a leftover scrap of the nylon first), then treat it with a DWR (Durable Water Repellent) finish such as one sold by Nikwax. The white tent will look good with a colorful dyed tent fly. Does the tent already have a detachable fly? If so, you can use it as a pattern in sewing your own. On a nylon or polyester fly, if you’ve sewn it yourself so it’s not yet coated with a DWR finish, you can also use transfer printing. The dyes used for transfer printing are actually disperse dyes, for synthetic fibers only; you use them by painting your design onto paper, letting it dry, and then ironing it onto your fabric. 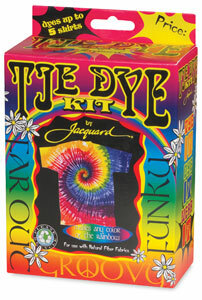 One source for transfer dyes in your area is Omega Dyes, which you can order from online. For a small example of the use of transfer dyes, see my page “Iron-on Fabric Crayons for Synthetic Fibers“. For more details on the question of dyeing a tent, see my earlier blog page, “Is there a way to tie dye a tent?“. This entry was posted in dyeing nylon and tagged dyeing nylon on July 3, 2014 by pburch. How can I dye a white- or clear-bristle fingernail brush so that the bristles are easier to spot when they fall out? Message: I have a black bristle fingernail brush. The bristles are beginning to come out. They are easy to spot in the sink or shower and pick up so they don’t go down the drain. How can I dye a white or clear bristle brush to be able to spot them so they don’t go down the drain? I will appreciate any suggestions you may have to solve this. Some acid dyes will last longer in the nylon than others. The acid dye in a Rit All-Purpose dye mixture will work on nylon (the cotton dye also contained in Rit dye will do nothing to nylon), though it will tend to wash out more quickly than other types of acid dye. It’s worth trying, because it will probably last well enough for your purpose, and then, if it washes out too quickly, you could look for a longer-lasting dye to try again. Rit all-purpose dye can usually be found in a local grocery store or craft or sewing store. As always with Rit all-purpose dye, the color you get may be rather different from the color predicted on the outside of the box, perhaps a dark green or purple, when you expect to get black. If the Rit all-purpose dye works but you want a longer-lasting dye, and if you would prefer black, I would recommend you order a dye called Washfast Jet Black WF672, which is Colour Index Acid Black 172, from PRO Chemical & Dye, as it is a particularly wash-resistant acid dye. This dye produces a reliable dark black, assuming you use enough dye powder. Then again, if you are going to go to the trouble of ordering online, you could probably find and order a black-bristled fingernail brush, instead. If Rit all-purpose dye does not color a fingernail brush’s bristles, even temporarily, that would be a sign that the bristles are made of an undyeable polymer. A few fingernail brushes are made with polypropylene bristles, which cannot be dyed at all; colored polypropylene has pigment added in the manufacturing process, while the polymer is still liquid. Assuming that your bristles are made of nylon, my one concern is how the bristles are held in the brush. I don’t know how this is done. If they are held in with a heat-sensitive adhesive–that is, hot glue–then bristles will fall out when you heat the brush, in your mixture of water, dye, and vinegar. If they are held in another way, then there will be no problem. The nylon itself should tolerate temperatures up to a 205°F simmer, just under boiling temperature. Do not bring the dyebath to a full boil, for fear of damaging the nylon. Some fingernail brushes are made with natural bristles, rather than nylon bristles. These are stiff hairs from hogs. Natural hair bristles will take exactly the same dyes that nylon will, using the same procedure. This entry was posted in dyeing nylon on June 23, 2014 by pburch.